Journey into the heart of Montana’s Island Range and its checkerboard of land ownership. The sound of flapping nylon follows the rhythm of howling wind gusts. A continuous blast piles snow around the littering of tents, slowly constricting them as the storm pushes through the night. A spring squall in the Crazy Mountains of southwestern Montana is delivering. It’s late April and far out in an island mountain range high above the plains, a crew of 10 is camped out. They’re exploring this lesser known range. When and where to ride will be the new challenge when the storm ceases. Sensitive snowpack and private property confine their exploration. Yet this range is rich with lines and the crew is in it for the long haul. 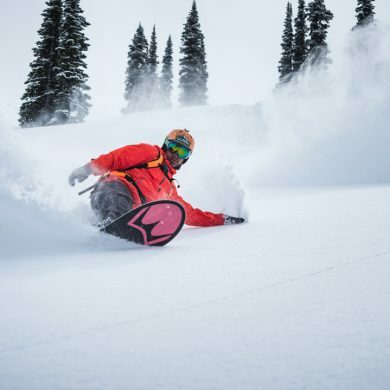 The trip was born from the mind of pro-snowboarder Jeremy Jones, who roped in fellow riders Wyoming’s Mark Carter, Canadian Robin Van Gyn and a Teton Gravity Research production crew. Aside from a little snowmobile support haul in camp, the trip is foot-powered. For Jones, taking this extended camp out method in the spring is all about exploring new areas with a safer, slower approach. Considered an island of mountains, The Crazies are a lonesome mass of rock surrounded by a sea of plains. They span nearly 600 square miles. At lower altitudes, they contain thick forest and lush drainages. 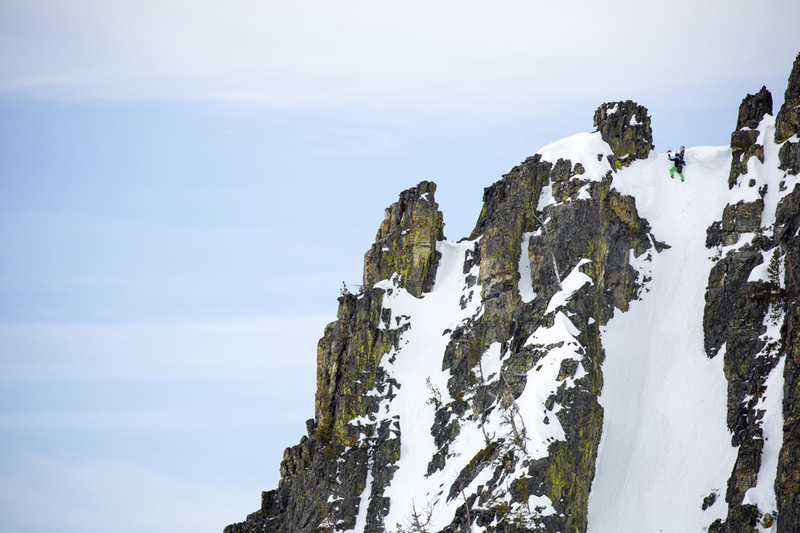 Up high, steep, jagged peaks top out at the 11,214-foot Crazy Peak. Their isolated position leaves them prone to strong winds, which often grate away snowpack. However, this past season they’d seen record snowfall. Their namesake comes with interesting lore, too. Another tale, free from colonialist undertones, stems from the Native American Crow people who called the range Awaxaawapìa Pìa (Ominous Mountains). They believed the mountains had metaphysical powers and remained unpredictable. The Crow also believed in the mountain’s spiritual significance and travelled into them for vision quests. 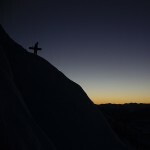 When it comes to the mountains, not everyone sees them in the same light. For some, they’re the most magnetizing playgrounds on the planet. Others simply like to look at them from a safe distance. Then there are the few who want to capture and own them. The latter is a touchy, complicated subject here in the Crazies. Shrinking public lands and lethal private property rights are indeed alarming naturalists and recreationists alike. But perhaps stranger than America’s battle to protect public lands are its public land islands. These areas are swaths of public land circled by private property with little to no access to the communal terra. Montana has a lot of them and the Crazies fall somewhat into that category. To be able to live in the heart of the range for as long as we did was unique. Early land use in the Crazies boils down to this brief. When settlers spread westward the federal government incentivized railroad expansion by offering every other mile for free. This created a checkerboard of land ownership. Lands that were not later wrapped into national forests were sold off and many became private ranches. Although there are a handful of public routes, these private tracts guard a good amount of pristine forest, even a few select mountains. 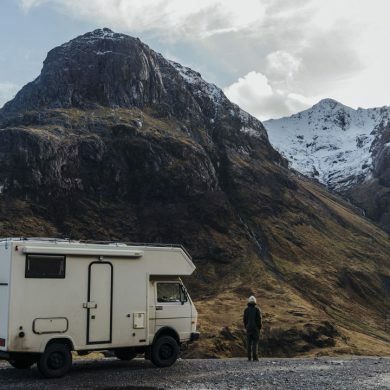 “I have never had a situation like this, where I looked at a pristine mountain deep in the wilderness and was told we should not go there because it is private property and the owner may come after us,” Jones said. In the end, the crew was not deterred. They camped for 10 days and rode two to three peaks or lines a day, legitimately on public land. And there were countless other ones Jones wished he had time to ride. 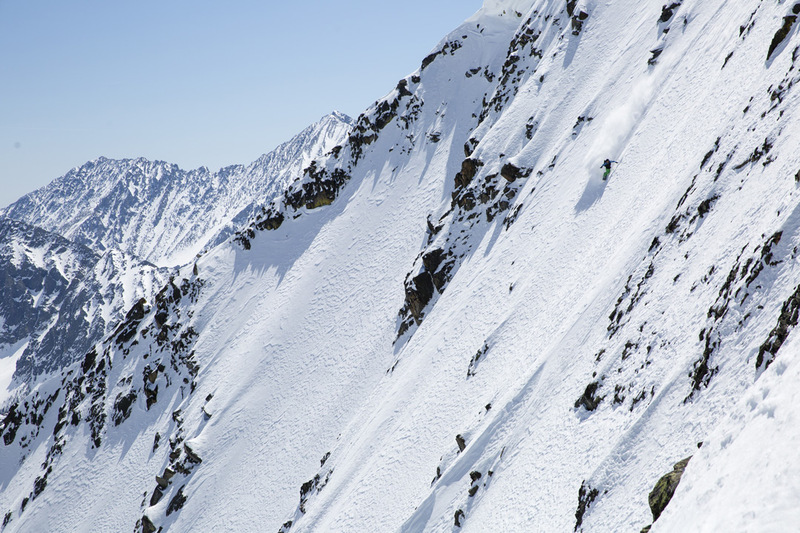 The potent and packed terrain made for quick ups and downs rather than long approaches. Long lit spring days aided the riding, too. “To be able to live in the heart of the range for as long as we did was unique,” Jones said. Because everything is close together, it is easy to hike and ride multiple peaks in a day, Jones added. 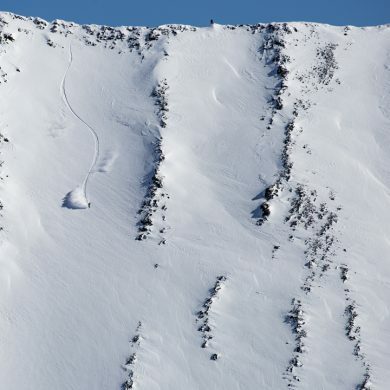 The range is full of tightly stacked, steep lines of size and variety. Capable and committed, the group’s pursuit and perception grew each day. 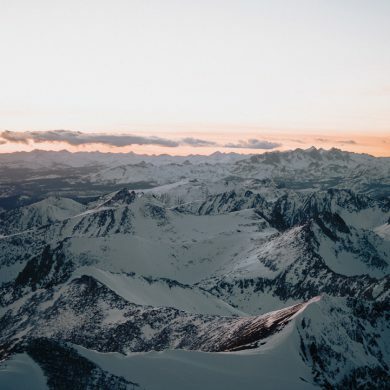 It came with sunsets burning over layered ridges of the Absarokas to the south and calm, clear cobalt nights as the moon glowed off the glazed white grounds. Sprays of fresh snow briefly blurred their sights. 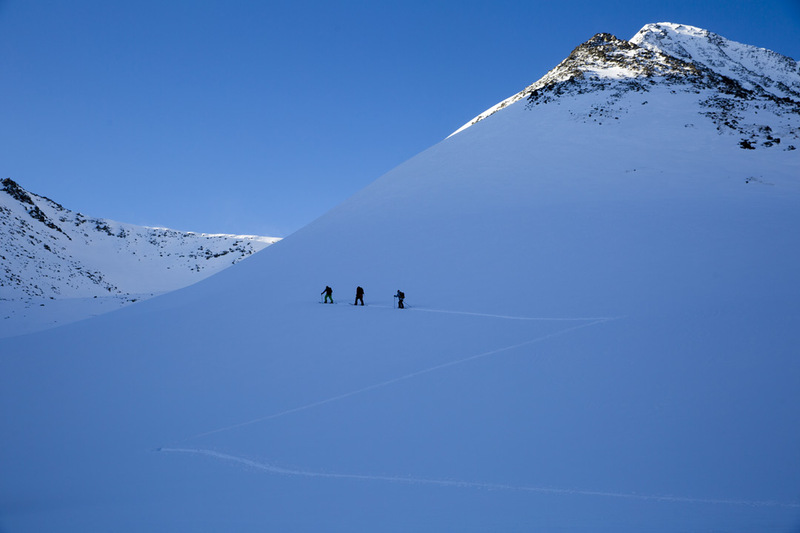 Memories were logged of knife ridges, lake basins, bowls, couloirs, un-navigable rock walls and long powder lanes. Minds and bellies were filled with laughter, tales and camaraderie. Pale blue shitbags were filled to the brim at a pace of 10 a day. Bodies were worn, ground by sun and snow. Living among the mountains in winter, even with elite gear, is tough. Yet it’s a life that inspires. Existing in wilderness shows who’s in charge all the time. In the end, we don’t own this land or its mountains and never will. It owns us.